The interstitial cells of cardiac valves represent one of the most frequent cell types in the mammalian heart. 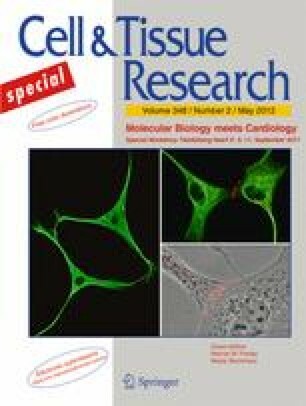 In order to provide a cell and molecular biological basis for the growth of isolated valvular interstitial cells (VICs) in cell culture and for the use in re-implantation surgery we have examined VICs in situ and in culture, in fetal, postnatal and adult hearts, in re-associations with scaffolds of extracellular matrix (ECM) material and decellularized heart valves. In all four mammalian species examined (human, bovine, porcine and ovine), the typical mesenchymal-type cell-cell adherens junctions (AJs) connecting VICs appear as normal N-cadherin based puncta adhaerentia. Their molecular ensemble, however, changes under various growth conditions insofar as plakophilin-2 (Pkp2), known as a major cytoplasmic plaque component of epithelial desmosomes, is recruited to and integrated in the plaques of VIC-AJs as a major component under growth conditions characterized by enhanced proliferation, i.e., in fetal heart valves and in cell cultures. Upon re-seeding onto decellularized heart valves or in stages of growth in association with artificial scaffolds, Pkp2 is — for the most part — lost from the AJs. As Pkp2 has recently also been detected in AJs of cardiac myxomata and diverse other mesenchymal tumors, the demonstrated return to the normal Pkp2-negative state upon re-association with ECM scaffolds and decellularized heart valves may now provide a safe basis for the use of cultured VICs in valve replacement surgery. Even more surprising, this type of transient acquisition of Pkp2 has also been observed in distinct groups of endothelial cells of the endocardium, where it seems to correspond to the cell type ready for endothelial–mesenchymal transition (EMT). Some parts of the present report are from the PhD thesis of Mareike Barth (2011). The work was supported in parts by the German Cancer Foundation (Deutsche Krebshilfe, grants 10-2049-Fr1 and 106976 to WWF) and the Federal Ministry for Research and Technology (START-MSC; grant 01GN0942).